On May 31 world media headlines read “Monsanto backing away from GMO crops in Europe.” But before the world opens the champagne to celebrate the death of GMO, it is worthwhile to look more closely at what was officially said and what not. The original source for the story is attributed to a German left daily, TAZ which printed excerpts from an interview with an official spokeswoman of Monsanto Germany. A Monsanto interview with a leftist German paper created the impression around the world that the world’s largest patent-holder of GMO seeds is in full retreat from pushing their GMO seeds, at least in the European Union. The reality is anything but that. Among other things, on June 10 the EU Commission plans to approve a new Monsanto GMO maize sort. Both statements are worth closer attention. First the German statement is a bit different from the US version. It officially denies as false the press reports that they have ceased marketing of GMO seeds in the EU. Second, their statement that they concentrate on breeding and sale of conventional seeds and plant protection chemicals is nothing other than a description of what the present status of Monsanto sales in the EU, nothing more. Because of the limited use so far of Monsanto GMO seeds in the EU, Monsanto business by definition focuses now where it earns money. However the “plant protection chemicals” Monsanto refers to primarily its own Roundup herbicide, which by license agreement with farmers must be sold paired with all Monsanto GMO seeds, but is also the number one weed killer sold in Europe and the world. It has also been proven to be highly toxic even to human embryo cells. The US statement has interesting important differences. First it gives no hint of any change in Monsanto policy towards spreading GMO seeds in the EU. It states explicitly they will continue to spread GMO seeds in Spain and Portugal, both EU countries. And it quotes chairman Hugh Grant, not to be confused with the Hollywood actor, indicating the company expects the EU to come around on allowing its GMO. And it cites the present status of its GMO corn in the EU. Nothing more. No statement of a stop to GMO in the EU. The EU Commission has announced it will meet to vote on approving licensing of a new Monsanto GMO patented maize, SmartStax, on June 10, ten days after the carefully formulated Monsanto FAZ interview. Monsanto shares the patent with Dow AgroSciences. SmartStax supposedly produces six different insecticides. It has been approved by the EUs food safety agency, EFSA despite absence of critical safety tests and Commission approval is reported certain by Brussels sources. 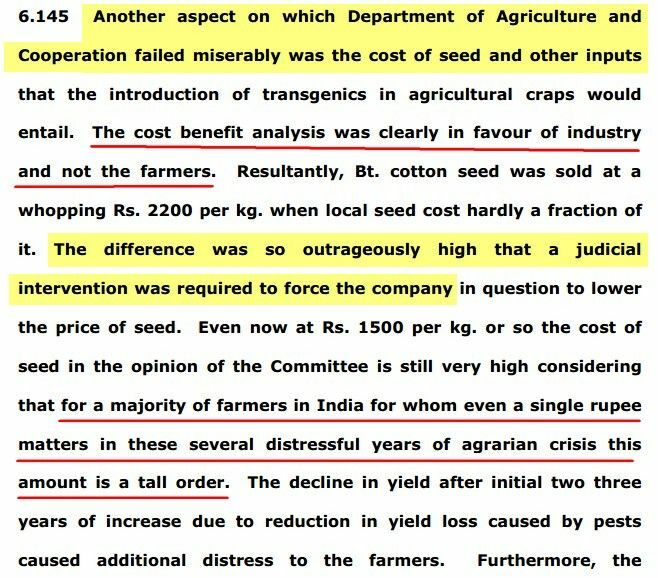 According to Dr. Christopher Then of TestBiotech, SmartStax was given the safety OK from the (Monsanto influenced-w.e.) EFSA, the European food safety body, despite provable lack of serious safety tests by Monsanto/Dow AgroSciences. Yet for most of the world who don’t have time to research the official statements of Monsanto but merely glance at a Reuters or TAZ headline, the message has been delivered that Monsanto has given up its EU effort on proliferating its GMO seeds. The timing of the TAZ interview is suggestive of what seems to be a carefully orchestrated Monsanto PR deception campaign. The TAZ original by writer Jost Maurin appeared on the same day, May 31, less than one week after March against Monsanto , a worldwide protest demonstrations against Monsanto, that took place in more than 400 cities in some 52 countries around the world. The TAZ article that was then used as reference for all world media after, appeared under the emotional and factually misleading headline: Sieg für Anti-Gentech-Bewegung: Monsanto gibt Europa auf (Victory for anti-GMO Movement: Monsanto Gives up Europe). Called by opponents the Monsanto Protection Act, many members of Congress were apparently unaware that the Monsanto Protection Act was a part of the spending bill that they were voting on. The Monsanto bill, signed into law by President Obama despite hundreds of thousands of protest petitions not to, essentially gives Monsanto and other GMO purveyors legal immunity, even if future research shows that GMO seeds cause significant health problems, cancer, anything. The federal courts no longer have any power to stop their spread, use, or sales. The only other corporations in the US enjoying such outrageous legal immunity are the pharmaceutical vaccine makers. The Terminator image threatened to derail the entire fledgling GMO project at the outset such that Rockefeller University President and GMO financial sponsor, Gordon Conway, president of the Rockefeller Foundation, made a rush visit to meet Monsanto’s board and convince them to make what was a tactical retreat in order to limit damage to a very fragile GMO campaign worldwide. Monsanto announced, deceptively it proved, that it would not pursue “commercialization” of Terminator technology and it dropped its takeover bid for patent holder Delta & Pine Land. The anti-GMO NGOs claimed a huge victory and nothing was heard for seven years until, with no fanfare, in 2006 Monsanto announced it was acquiring Terminator patent co-holder Delta & Pine Land. This time there was scarcely a peep from the anti-GMO lobby. They had lost momentum and the deal went ahead. via Monsanto’s plays deception game on GMOs in Europe : The Canadian National Newspaper. Autonomy is Sown! A nutrition group from the “Escuela de Cultura Popular de los Martires de ’68” displays posters celebrating the autonomy of indigenous Zapatista communities for whom corn is an essential crop. Street Art celebrating Mexico’s staple food: Corn. A group of “youth in resistance” celebrate native corn with live Son Jarocho music and colorful cardboard corn. Urban Farmers transported their crops via bike emphasizing the importance of sustainable agriculture without GMO seeds. We will defend our corn! The thousands of protesters marched down principal avenues in Mexico City to arrive at The Monument of the Revolution. We are not your #$%$* science experiment. A genuine concern about the scientific effects of GMO crops was a common thread in protesters signs. Protestors weren’t just saying “not in my backyard” but instead stating that they want Monsanto kicked off the planet. Corn husks usually serve as wrappers for one of Mexican‘s most popular street foods, tamales. In the anti-Monsanto march husks served as adornment for all kinds of costumes. Protesters sport corn husks to emphasize the importance of native corn for the Mexican diet. A group of enthusiastic dancers stripped down to the basics – corn. Jubilantly celebrating the crop they took to the street in front of the Alameda. Andalusia Knoll is a multimedia journalist based in Mexico City. She is a frequent contributor to Free Speech Radio News, The Real News Network and Toward Freedom and collaborates with various independent media collectives throughout Mexico. You can follow her on Twitter at @andalalucha. 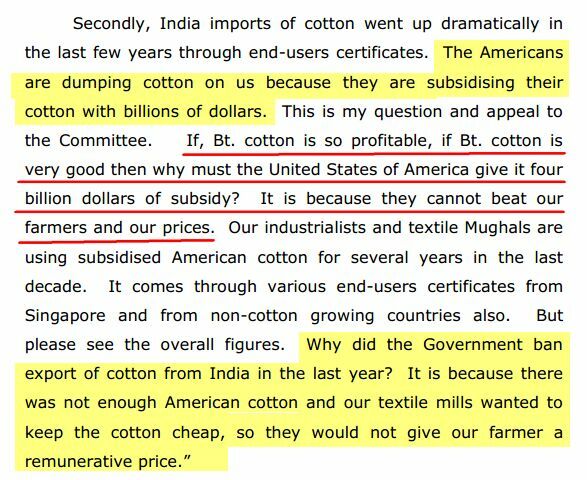 In India, a cotton farmer drinks a liter of pesticide, killing himself to escape the ruinous combination of his debts and a poor yield. In America, a pediatrician observes improvement in the symptoms of autistic children when they stick to a purely organic diet. In France, farmers burn fields of genetically modified crops. In Paraguay, a politician tells the media that Monsanto was behind the ouster of a democratically elected president. On May 25, 2013, the mainstream media generally ignores millions of protesters in hundreds of cities across the globe rallying against Monsanto and Genetically Modified Organisms (GMOs). All of these seemingly disparate events flow from a single source: the business model of one of the wealthiest, most powerful, and most aggressive corporations on the planet. The story of Monsanto begins in the auto industry. In the early 20th Century, Henry Ford defined contemporary industrialism. In the business model of Fordism, the company automates production, mass-produces a reliable, standardized product and pays its workers a living wage, enough that they can afford to buy the product. Beginning in the 1920s, this model was challenged and eventually eclipsed by a different business model developed by General Motors Corporation (GM). GM President Alfred P. Sloan believed that the corporation’s goal should not be a cycle of production-wage-consumption, as Ford had built. The corporation’s goal should be very simple: profit. The business model of Sloanism relied on planned obsolescence, evolving fashion, and a product line for “every purse and purpose.” GM hooked the consumer to regularly purchasing an ever-changing product. People who were instrumental in developing the business model of Sloanism, and the strategy of locking the consumer into dependency on products that require each other, migrated from GM to the top of Monsanto. One can easily see similarity between the GM cars and leaded gasoline of nearly a century ago and Monsanto’s Roundup herbicide and Roundup Ready GMOs of today. Throughout its history, Monsanto has developed chemical products which have eventually become controversial or been banned, including DDT, Agent Orange, Bovine Growth Hormone, and PCBs. DDT was used for decades as an insecticide even though its effect on humans was not well understood. Monsanto insisted it was safe, but it was revealed to be highly toxic and was banned. Agent Orange is a highly destructive defoliant, most famous for being used extensively in Vietnam. Decades later, it continues to cause health problems, birth defects and ongoing soil damage. Bovine Growth Hormone was designed to spur cows’ milk production. It caused painful udder inflammations and infections which got into milk. PCBs are a highly toxic chemical used as a coolant. Documents demonstrate that Monsanto knew of the threat posed by PCBs for many years and sought to cover up the danger it posed, while continuing to expose people and the environment to the chemical. Many people have had serious health problems in the town of Anniston, Alabama, where Monsanto dumped PCB waste. 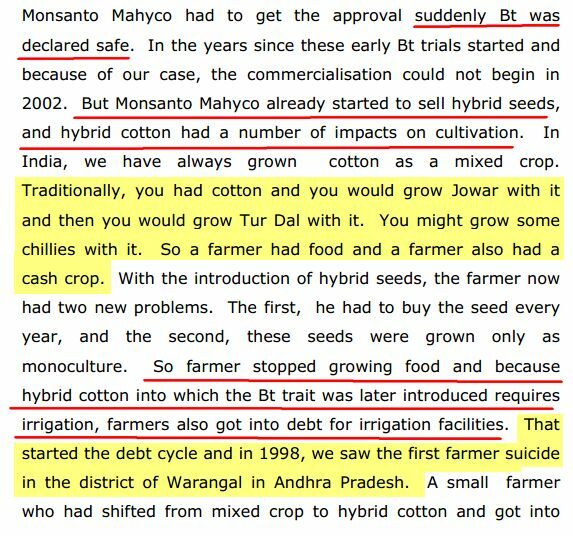 via nation.lk ::: – MONSANTOPOLY Part 1: Sowing dependence. Dr. Mezzomo and his team of Scientists from the Department of Genetics and Morphology and the Institute of Biological Sciences, at University of Brasilia recently published a study that involved Bacillus thuringensis (Bt toxin) and its effects on mammalian blood. According to the study, the “Cry” toxins that are found in Monsanto’s GMO crops like corn and soy, are much more toxic to mammals than previously thought. The study was published in the Journal of Hematology and Thromboembolic Diseases(1). Dr. Mezzomo and his team are not the only group of scientists to discover the harmful effects of Bt toxins. Professor Joe Cummins, Professor Emeritus of Genetics at the University of Western Ontario has also studied it (2)(3)(4). He concluded that that there is sufficient evidence that the Bt toxin will impact directly on human health through damaging the ileum, which is the final section of the small intestine that is responsible for the absorption of vitamin B12. He also points out that the Bt cry toxin gene has not been proven to be the same as the natural bacterial gene. As mentioned in the first paragraph, it occurs naturally in the environment, usually isolated from soil, insects and plant surfaces. via Scientists Discover Bt Toxins Found In Monsanto Crops Damage Red Blood Cells.